By 2007, our music collection was in disarray. We had three CD towers that each fit 400 discs, a sprawling mass of smaller CD racks behind and beside them, plus stacks and stacks, and stacks, of jewel boxes. They took up the entire front end of our old apartment, plus plenty of space in the “den” (which was basically a cramped walk-in closet), where additional racks and stacks could be found. Oh, and did I mention that each of the towers had snapped at the base? Or that, while certain – usually newer – CDs were within reach, finding specific titles often turned into an hours-long chore? You’d sort through one pile, then another, and then another, and hopefully find what you wanted by day’s end. It was a headache and a half. That’s why, that January, I invested in an expensive ($199) 500-gig Western Digital external HD, encoded every track as a 256 or 320 kbps MP3 – about 2500 discs at the time – and then boxed everything up. In a sense, I created our own private Spotify. In the years that followed, we continued to purchase and rip CDs, but – like many others – also we began buying downloads via iTunes, Amazon Music, Bandcamp and HDTracks, and then subscribed to Apple Music. When a CD, I rip before listening, as I listen to encoded files via my MacBook, iPhone or Pono Player – either via my THX-branded Logitech computer speakers or my Bluetooth-equipped stereo system. I also re-ripped many of the same discs, this time as FLAC files, three years back, though they’re housed in a separate library. 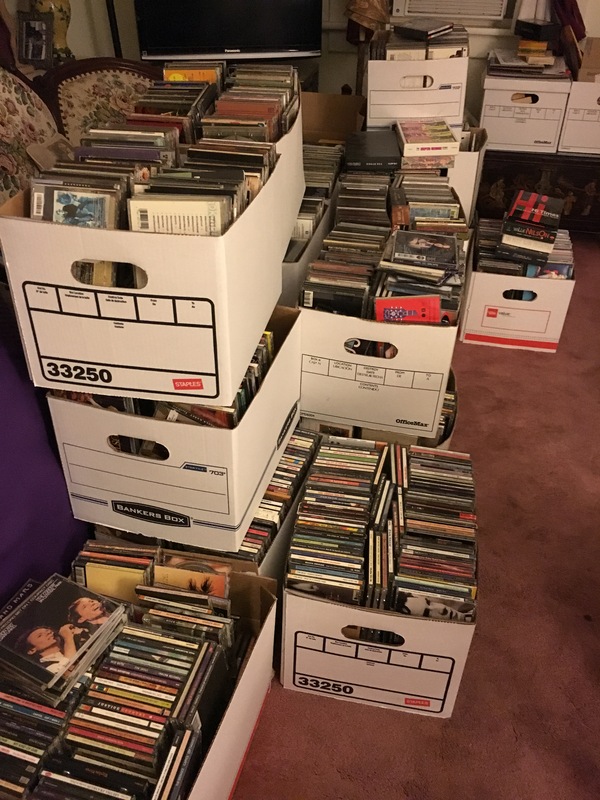 But now that we’re preparing to move – and, at least for a time, downsize to an apartment – the question is: Do we want to ship 20+ boxes of CDs across the country just to put them in storage for the next six or 12 months? Especially since we don’t actually listen to them? 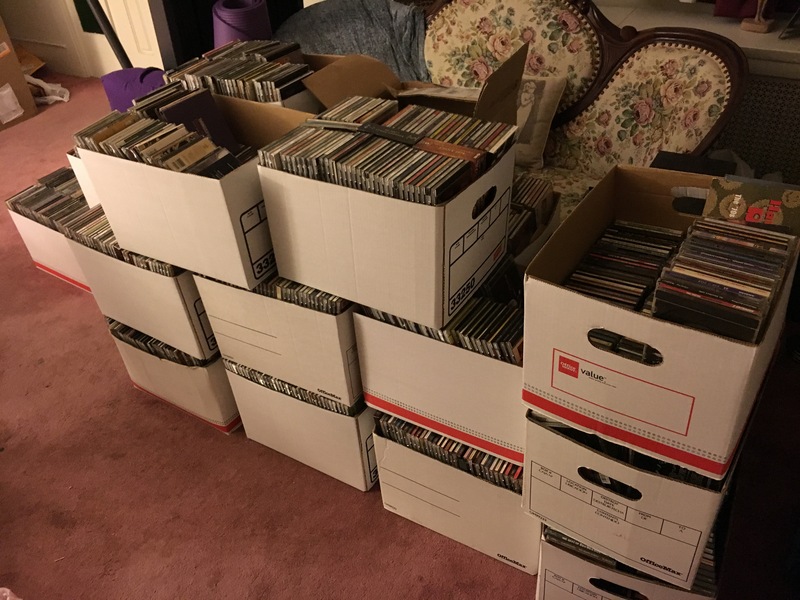 And what of our hundreds of LPs, some of which date back decades? Do we get rid of them, too? The reason that our CD collection continued, and continues, to grow: We buy new releases from old favorites, of course, but also releases from new and relatively new artists. We’re out of the mainstream in that regard. A recent survey by Deezer shows that most folks experience what’s dubbed as “musical paralysis” by 30 years of age. They stop seeking out new sounds and artists, and instead listen to the same-old, same-old, over and over, and over, again. The demands of life, work and raising kids, and competition from TV and video games, has made the music-discovery process too much of a time-sucking chore. What’s a chore to one, of course, is pure joy to another. I can’t imagine not digging through the digital bins of Apple Music and YouTube, or flipping through the pages of Mojo and Uncut, in search of something new. And, with that, here’s today’s Top 5: Our Own Private Spotify (aka New Music, Vol. LXXIII). 1) Paul Weller – “Gravity.” Weller’s recent True Meanings album is one of the year’s best, and in weeks to come – if I can carve out the time – I hope to review it. For now, here’s the video for “Gravity,” which he released this week. 2) American Aquarium – “The World Is on Fire.” Echoes of Bruce Springsteen and Steve Earle can be heard in the North Carolina band’s stellar work. This performance is from a recent appearance on Last Call With Carson Daly. 4) Stonefield – “In the Eve.” I know next-to-nothing about this Aussie band, which was featured in Paste Music’s “Daytrotter” sessions this week, other than they’re four sisters, they’re a tad retro, and very cool. I look forward to digging into their oeuvre in the weeks ahead. There’s more, of course, and – as with “The Idea of Order at Key West” – much of the poem is referential and deferential to the power and source of poetry (and art as a whole) – it’s a perfect subject for a thought piece, right? A nor’easter blew through the Philly region (and the Northeastern U.S.) yesterday. Among its other misdeeds: heavy rain, strong winds and blinding snow. 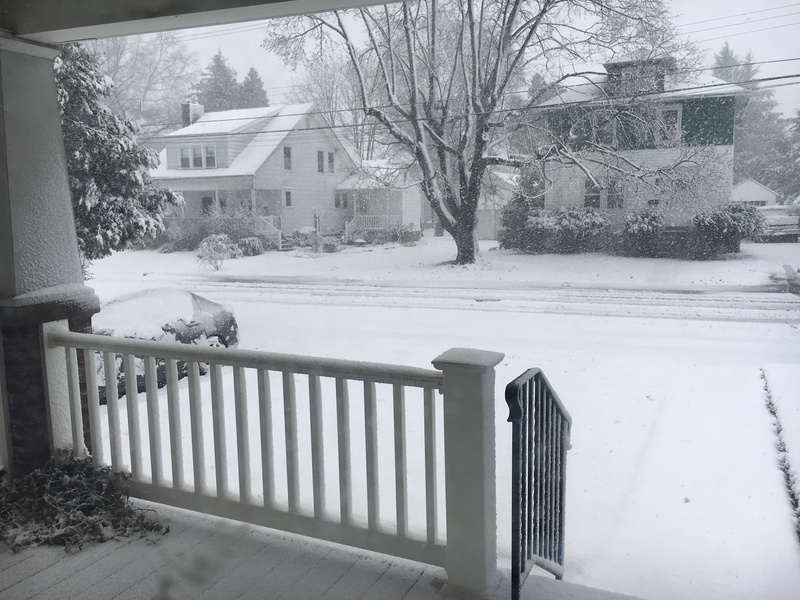 It was the first two that caused me to work from home; the snow was something of a surprise, as the last weather map I saw showed my hometown on the borderline between receiving none and two-or-so inches. (And if the latter, said the same report, accumulations would mainly be on the grass.) So imagine my surprise when I opened the front door at 12:30pm and saw what appeared like a white blanket draped across the neighborhood. But, as the minutes turned into an hour, and that hour into hours, it became obvious that it wasn’t to be soon. I have several portable hard drives filled with music, but we wanted to be transported into another world – a good movie or TV show. Without access to the Cloud, or my powered hard drives (where I store things I’ve downloaded through the years, options were severely limited – some episodes of Pretty Little Liars, which Diane never got into, and the pilots for Veronica Mars and Once Upon a Time, which were both free downloads at some point from iTunes. So we watched both on my MacBook while lying beneath a small stack of blankets in bed. This morning, cell reception was back though the electricity wasn’t – but it wasn’t a super-cold night, so in that sense we were blessed. 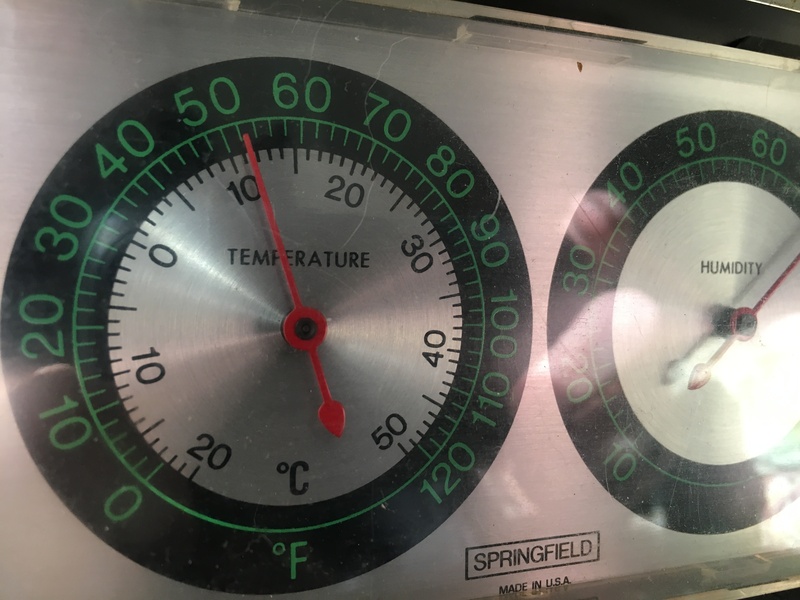 The downstairs was 52 degrees (Fahrenheit), as the picture shows; it could have been much, much worse. After a run to Dunkin’ Donuts, where the Girl Scouts-branded Coconut Caramel coffee truly hit the spot, we gathered our various gadgets and hightailed it to my mother’s to charge everything that needed charging. 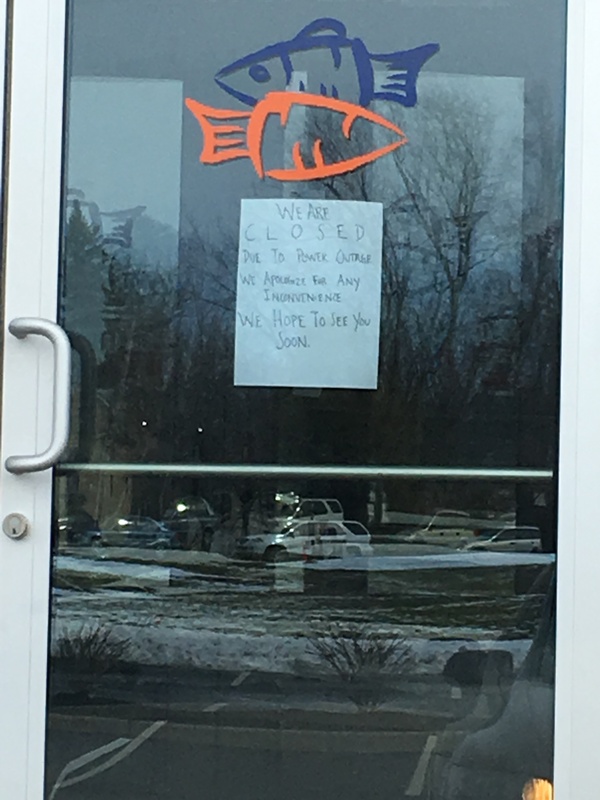 It was there, round about noon, that we learned from Facebook that our power had likely been restored, as a nearby business was back online. And, sure enough, when we swung home, it was – the upstairs TV was blaring like a banshee. And, with that, here’s today’s Top 5: Of Marshmallows, Music & Nor’easters. 2) Maryanne Window & Mary Lou Lord – “Long May You Run.” So I just discovered this sweet rendition of the Neil Young classic, which is from early 2014, this past week. Maryanne Window is an Australian musician and producer, and collaborated with Mary Lou on her 2015 Backstreet Angels album (an overlooked treasure). Here, she takes the lead while Mary Lou sings backup. 5) Laura Marling – “A Hard Rain’s a-Gonna Fall.” The British folksinger recorded this spellbinding cover of the Bob Dylan classic for the Peaky Blinders finale. 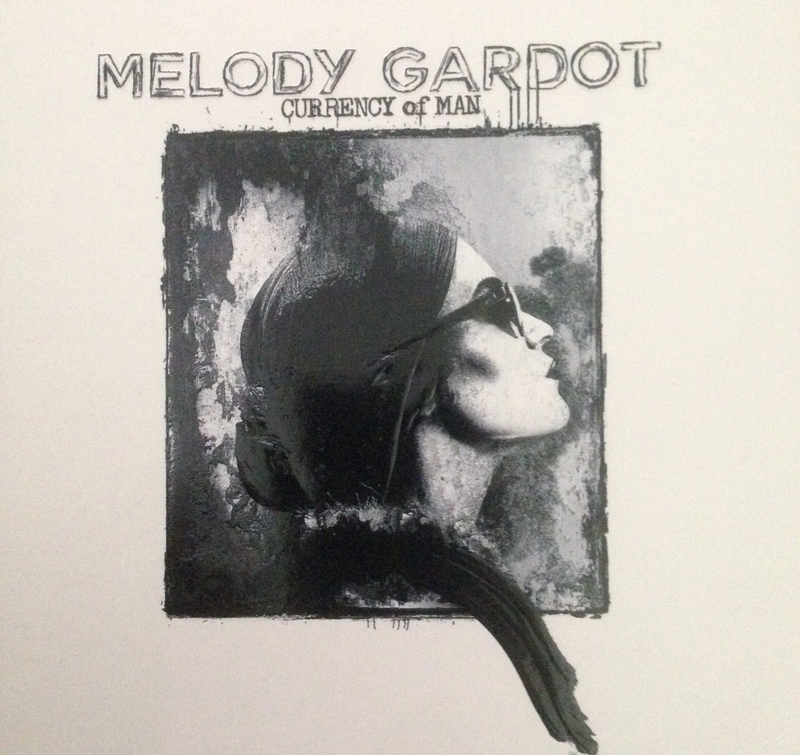 1) Another week, another Melody – this time, “Bad News.” I’ve written in-depth about the mesmerizing Ms. Gardot before, so won’t rehash too much here. But, at the time that I discovered her music, I was enamored (some might say obsessed) with the music of another jazz chanteuse, Peggy Lee, whose Black Coffee album is as sultry a set of songs ever pressed to vinyl. As I listened to Melody’s new Currency of Man album this week, it occurred to me that “Bad News” would easily fit on Black Coffee between “A Woman Alone With the Blues” and “I Didn’t Know What Time It Was.” Currency of Man is the best new release I’ve heard this year. 2) Mary Lou Lord – “My Buddy Valentine.” So, during the early ‘90s, I often bought a very cool music magazine called CMJ New Music Monthly at Tower Records. Every edition included a CD of the music reviewed therein, which focused primarily on alternative sounds. The collections were, as one might expect, hit-or-miss affairs – but, so what? Nuggets were to be found, too, including one that was my introduction to Mary Lou Lord: “Some Jingle-Jangle Morning.” It’s indie-pop perfection. As is, all these years later, her latest album, Backstreet Angels. This, the lead single, was released a few months ago. 3) Carole King – “Up on the Roof.” An oldie, yes, and a true classic. Written by Gerry Goffin and Carole King, it was a hit for the Drifters in 1962; and has since been covered by hundreds of artists, including the Grass Roots, Laura Nyro, Dusty Springfield and Neil Diamond, It’s as perfect a song ever written, I think, and if released today – by, say, Diane Birch – it would be a hit. 4) Diane Birch – “Waterfalls.” Speaking of the high priestess from the Church of Birch… she recently uploaded this beautiful rendition of the Paul McCartney song (from McCartney II) to Soundcloud. 5) I admit it: There’s much I don’t know. Take Miley Cyrus, for instance. Oh, I’ve flipped past her picture (and articles about her) in Rolling Stone from time to time, and I do recall a mashup of her “Wrecking Ball” with Bruce Springsteen’s same-titled song, though I never watched it. I just never gave her much thought. In fact, if you’d asked me a few weeks ago, I’d have summarized her as thus: the onetime Disney moppet who taught the world to twerk. I still would, but I’d add: the gal can sing. The first inkling I had of that fact came on the overblown (and way too long) SNL 40th anniversary special, when she delivered a breezy take on Paul Simon’s “50 Ways to Leave Your Lover.” Then came her most recent Backyard Sessions clips, which she released to publicize her new charity, the Happy Hippy Foundation, which is geared to helping homeless kids. This song, a duet with Melanie Safka on Melanie’s “Look at What They’ve Done to My Song, Ma,” is a marvel. To all reading this: Check out Mary Lou Lord’s new song. It features a wondrous melody and to-die-for vocals and harmonies, and conjures an intoxicating sound (not to mention decade) long past. Cool lyrics, too. Bodes well for her forthcoming album. And, speaking of albums…Natalie Prass’ self-titled debut, released last week, is well worth picking up. Or downloading. I hear her as Tift Merritt crossed with Kate Bush with a dash of Dionne Warwick or Diana Ross mixed in, a super-sweet voice accenting a somewhat eccentric and adventurous musical palate.